One of the core values of the elmcity project is respect for authoritative sources. Every event that syndicates into the system should have an URL that points back to that authoritative source. In this example, Dave has pointed the url= tag at the events page at the ale house, which is also the URL that he fed to FuseCal in order to get it to produce the iCalendar feed. Let’s look at another example: the Thomas Jefferson Public School. Here, Google Calendar is the source of the iCalendar feed. 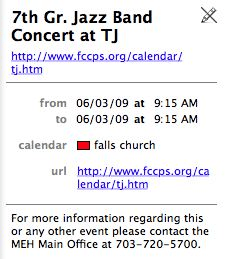 And Dave has bookmarked the web page in which the school has embedded that calendar. The link points back to the source. So far, so good. contact the MEH Main Office at 703-720-5700. But this perfectly sensible mapping fails for iCalendar. It turns out that many popular calendar programs don’t surface the URL field in an iCalendar VEVENT. Apple’s iCal does, but Outlook, Google Calendar, and Live Calendar don’t. In other words I’ve added a LOCATION field, which in this case was (not atypically) empty in the source calendar, and I’ve filled it with the same value that’s in the URL field. Notice how iCal renders both URLs — the one in the LOCATION field, and the one in the URL field — as clickable links. I wish the other programs also made an URL in the LOCATION field clickable. Reporting the source URL is better than not doing so. But the extra friction involved in copying the URL and pasting it into a browser will tend to prevent that from happening. Given all this, I’d love to hear suggestions for a better approach. One thing to keep in mind is that I’m trying to strike a balance between two conflicting goals. I want to make the downstream syndication formats useful. But not too useful, because I also want to build a connected ecosystem that helps all the upstream sources — including Eventful, Upcoming, and growing populations of iCalendar feeds — thrive. The elmcity service doesn’t aim to be a container of other people’s stuff. It aims to be a router, or actually a whole bunch of routers, each of which helps bootstrap a connected ecosystem in which people become the authoritatives sources of their own information, and in which they learn to syndicate that information to one another. Of course, none of these clients let you specify an ALTREP parameter so it may be a moot point. > Of course, none of these clients let you specify an ALTREP parameter so it may be a moot point. Yeah. ALTREP would make sense. But if URL is not respected, it would be surprising if ALTREP were. And it seems not to be. Previous Previous post: Dilbert might like the crazy way we do calendars online. But Scott Adams prefers a sane alternative.